The so-called international community which is allegedly united by the UN continues to demonstrate utter and complete impotency in the face of the unfolding tragedy in the south of the Arabian Peninsula, where a total of 23 million people in Yemen continue to face the harsh realities of a full-scale humanitarian catastrophe. This crisis was brought upon them by continuous air strikes of the Arab coalition led by Saudi Arabia that has obtained the silent support of Washington to carry on with the aggression. Up to this point the military intervention launched by Riyadh has been completely ignored by the UN Security Council, which in the past would at least try to provide some veil of legitimacy for Western powers when they would embark on yet another crusade against a sovereign state. Apparently, Washington’s actions in Libya and Ukraine have corroded international law to the point that now even pro-American satellite states can assault other countries without adhering to any legal norms. The White House is unable to mire itself in Yemen directly, with Saudi Arabia serving as a sad excuse for “regional policeman.” As for Iran, it doesn’t want to stretch any further beyond the “Shia arc”, therefore the region has found itself in a dangerous legal vacuum. It is crystal clear now that the US is no position to play the self-appointed role of regional arbiter, although it will not withdraw its military forces completely from the region. In this case, a direct military intervention in Yemen, especially with the use of ground troops, is practically impossible, as the precedent of Iraq has proven such interventions have disastrous consequences. So now any military-political groups in Yemen, as well as in the region as a whole, depend solely on the support (or the absence of it) of Iran or Saudi Arabia. The struggle between these two countries for regional supremacy has been carried out in armed conflicts in Lebanon, Iraq, Syria, and now Yemen. 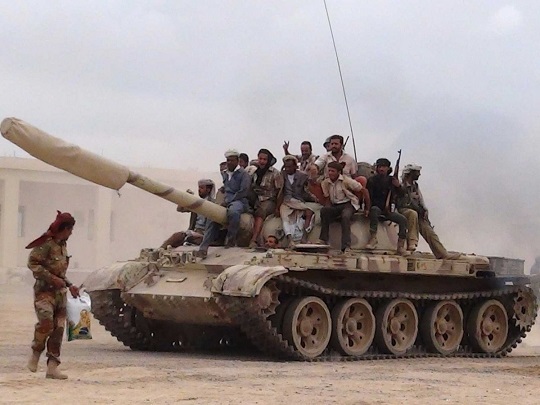 Moreover, the uprising of the Houthis has marked a new stage of a wider regional conflict. A direct military intervention that the Kingdom launched in Yemen has transferred its strategic rivalry with Iran to an open phase. The Shia-Sunni split in Islam is reflected most blatantly in Yemen. Now lies a long period of violence ahead of us, with a high probability that the conflict can escalate further even to the point of a global conflict. It looks like the humanitarian disaster in Yemen can reach the scale of the Syrian one..
What makes this conflict particularly dangerous is the fact that its actors are seeking ways to acquire nuclear weapons. So it comes as no surprise that against the backdrop of a direct military confrontation of regional powers in Yemen, the US is desperate to finalize the negotiations regarding the nuclear deal with Iran. Therefore, US policies face stiff criticism, coming from Washington’s closest allies in the region – Israel and Saudi Arabia. And any deal on the Iranian nuclear program between the US and Iran will not be accepted by these two countries, as they fear that the agreement will strengthen Iran in its quest to establish regional dominance. Regional strategic partners of the United States may change in the near future, and Yemen is but a bargaining chip in the struggle for dominance between Saudi Arabia, Israel and Iran. Yet, Washington is still involved in the military intervention in Yemen, since it has been providing the GCC states with logistical support and military intelligence. Yet, if the motivation of the United States, Saudi Arabia and Iran in Yemen is more or less clear, Russia’s policy in this country is a source of certain concerns. The diplomatic mission in Sana’a hasn’t been evacuated until now, while Russian citizens were being saved under fire by a rescue mission. As a result, the Consulate General in Aden has been ransacked by looters and the country suffered economic damage that is estimated to amount to several million dollars. It remains unclear why the lives of Russia diplomats and citizens were put at risk, since the economic cooperation between the Russian Federation and Yemen has been reduced to a minimum after pro-Western forces took over the country in 2012. Additionally, what was the reasoning for the support of the GCC initiative on a Yemeni settlement that does not ensure Russia’s interests in the country? It is not clear why it was necessary to support a draft resolution that was brought forward by the West in the UN Security Council aimed at strengthening the presence of pro-American and pro-Saudi forces in Yemen. Could Russia be acting in its worst interests? But then, why was it necessary to maintain a diplomatic presence in Sana’a to the point when all other foreigners were evacuated, and other embassies closed long beforehand? Russia’s actions in the UN Security Council are also bizarre. On April 14 this international body adopted a resolution banning arms supplies for only the Houthis, while other parties are still free to buy weapons anywhere. In this case, Russia’s permanent representative to the UN Vitaly Churkin stressed that Russia is not supporting the Security Council decision on Yemen, as in the process of discussion a lot of “constructive proposals” that were brought forward by the Russian delegation were simply ignored. There is no mentioning of the demand to all the parties of the conflict to cease fire and start a peaceful dialogue. In addition, according to Churkin, the resolution does not properly reflect the dire consequences that the civilian population in Yemen has to endure. Then who prevented Churkin, as a representative of a country that is a permanent member of the UN Security Council, to use its right to veto the resolution? Moreover, Resolution 2216 the way it was adopted condemns “unilateral action of the Houthis” and puts the rebel leader Abdul Malik al-Houthi and the son of the former president of Yemen Ahmed Ali Saleh on a sanction list . What about the condemnation of the Arab coalition’s aggression against Yemen that went forward without the consent of the UN Security Council? Has Russia recognized its legitimacy? This whole situation reminds the world of the vote on the Libyan resolution in 2011 that was forced upon the UN Security Council members by the West, where the Russian Federation also failed to use its right to veto. In short time, under the guise of fulfilling the resolution, the NATO-GCC began to bomb Libya, and then completely overthrew the legal government in Tripoli. Only time will tell what the reasoning is behind Russia’s strange behavior. But it’s clear that Moscow has nothing to gain from it.